In this course, Prof. Chris Tisdell gives 88 video lectures on Vector Calculus. This is a series of lectures for "Several Variable Calculus" and "Vector Calculus", which is a 2nd-year mathematics subject taught at UNSW, Sydney. This playlist provides a shapshot of some lectures presented in Session 1, 2009 and Session 1, 2011. These lectures focus on presenting vector calculus in an applied and engineering context, while maintaining mathematical rigour. Thus, this playlist may be useful to students of mathematics, but also to those of engineering, physics and the applied sciences. There is an emphasis on examples and also on proofs. Dr Chris Tisdell is Senior Lecturer in Applied Mathematics. 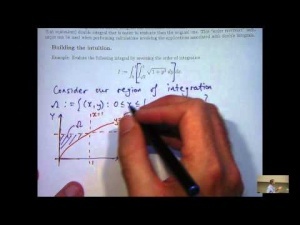 Prof. Chris Tisdell in Lecture 65: Reversing Order in Double Integrals. manikumar wrote 6 years ago. anil isharani wrote 7 years ago.